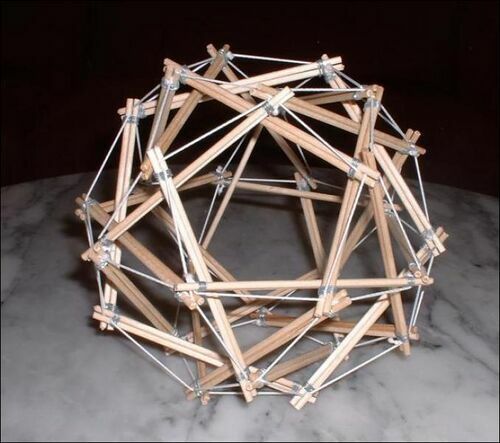 Read here about a significant person in tensegrity research. Adrian Rossiter maintains the Antiprism polyhedra visualization software, website and email list. He resides in El Puerto de Santa María. Antiprism software for for geometry visualization was developed for Adrian's personal use. as an aid to understanding and exploring ideas in geometry. It main focus is on high quality visual results, and not on precise numerical solutions, though the coordinate data for the models is usually highly precise. Rossiter has made the Antiprism programs open source under the MIT License, or similar permissive licences. Development can be followed through the Antiprism Git Repository. The Antiprism List can be used to ask for support, give feedback, or generally discuss the Antiprism programs. Rossiter's work is found in other pages of this wiki, for example he helped analyze the 92 Prism tensegrity. Adrian built many tensegrities that express standard polyhedra. The struts are pairs of barbecue sticks wired together, forming a strut-long groove. The photos are on his website. He often names the tensegrities after the polyhedra that their outline conforms to. 30 strut icosidodecahedron. Construction and photo by Adrian Rossiter.